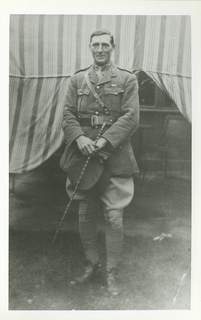 Son of : Frank Courtenay Slade and Jessie Maud Slade (née Bunting), of Gillingham, Kent. Born : 1 Nov 1887, Gillingham, Kent. The middle name is sometimes spelt Courtney, but I have kept to the spelling Courtenay in this biography. Married : Grace Florence Carter, registered Greenwich Dec 1917 qtr. 1891 : Jessie Slade is shown as a Wife on a Royal Engineers' Census return from Gillingham, Kent. Her husband Frank is not listed on this page but is presumed to have been in the Royal Engineers. Her son Frank is aged 3. 1911 : Frank Courtenay Slade, aged 24, is a Bombardier, V Bty, R.H.A., Taxile Barracks, Rawal Pindi, India. 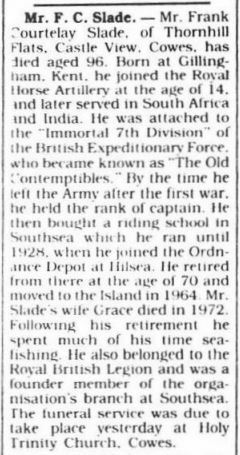 1939 Register : Frank C Slade, Grace Slade, and their children, are at 51 Hayling Avenue, Portsmouth. Frank Slade is a Storekeeper. 20702 Frank Courtenay Slade, Royal Horse Artillery. 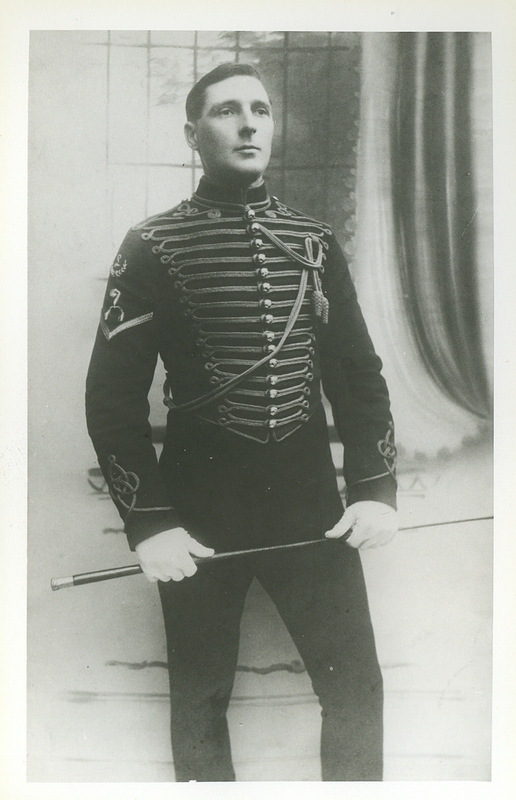 Promoted 2nd-Lt. and ended his Army career as a Captain. Died : 5 May 1984 aged 96, in Cowes. Thanks to Debbie Silk for photographs and other information. F C Slade was her grandfather.